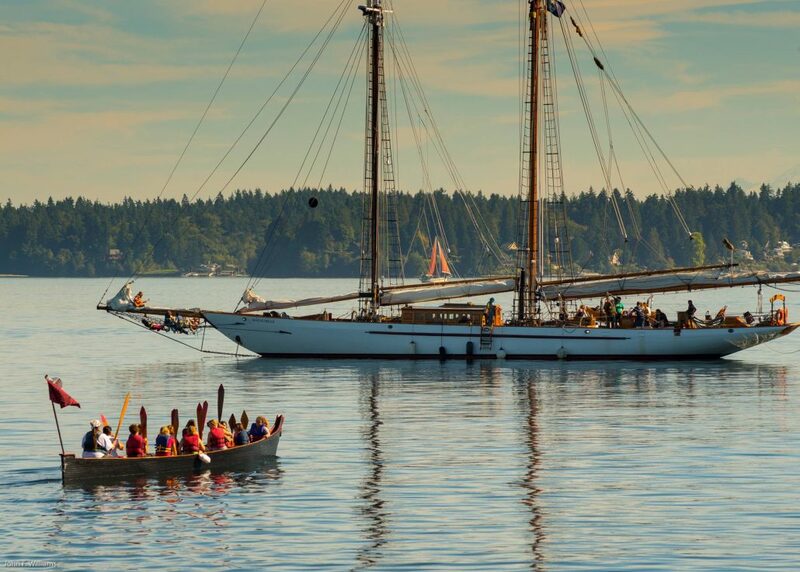 Canoe season is well underway and here on the Port Madison Indian Reservation we will soon be welcoming our relatives to our shores for the Suquamish hosting of this year’s Tribal Journey, Power Paddle to Puyallup. We expect our hosting to be rather large this year, with dozens of canoe families arriving on July 25, 2018 for an overnight stop on their way to Puyallup. When they arrive, we will welcome their canoes from the water and invite them to share songs, dances and meals with us at the House of Awakened Culture before we join them on the way to Puyallup the next morning. 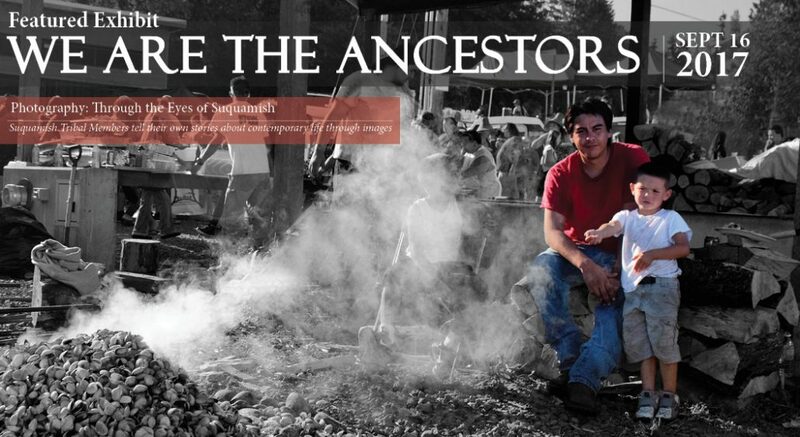 Many of our neighbors and community members are familiar with Tribal Journeys. 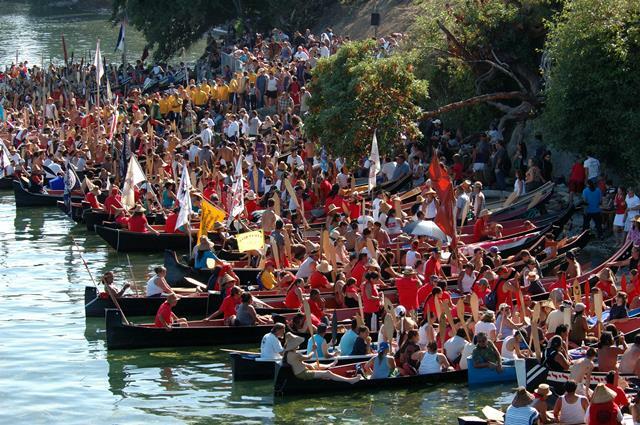 In Suquamish, we have been a part of the cultural resurgence since the 1989 Washington Centennial Paddle to Seattle. It is a deeply cultural event that provides us an opportunity to practice our traditional ways with one another, reaffirm our heritage and teach our youth. We appreciate our friends who have volunteered throughout the years to assist us in making our relations feel welcome. For new neighbors and community members just learning about Tribal Journeys, we would like to share a few details about the event that will help ensure we provide the best possible hosting for our relatives and guests again this year. Our relatives will arrive by water, landing in canoes near the Charles Lawrence Memorial Boat Ramp in downtown Suquamish between noon and 4 p.m. on July 25, 2018. The exact time of their arrival will depend on the weather, and tides. 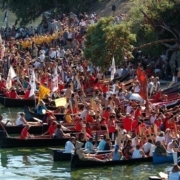 This year, we expect to welcome 65-75 canoes along with their support teams and ground crews. Community members and neighbors often watch the ceremonial welcoming from along with waterfront. If you plan to attend, we ask that you be respectful of the ceremonial welcoming area on the beach. Feel free to take and post photos on social media, record and stream live. However, we ask that you do so from the bluff above the beach or the dock, not from the beach where the ceremony is taking place. As part of our hosting, we provide a large outdoor meal for our guests, and those in our community who are participating in Tribal Journeys. As our traditions teach us, we serve our elders, those pulling in the canoes and our guests traveling for the journey first – then, we serve our tribal community and volunteers working the event. After our meal, canoe families will gather at the House of Awakened Culture to share songs and dances. Each canoe family is given the opportunity to share. With dozens of canoe families expected this year, the festivities may last well into the evening hours. Many of our relations and guests watch the event from inside the House of Awakened Culture. If you plan to attend and find yourself inside the house during protocol, please make sure to stay off the protocol floor (where dances and songs are shared). Additionally, listen to see if a song or dance should not be recorded. Canoe families usually make an announcement beforehand. We expect around 5,000 campers the evening of July 25, 2018. Most visiting canoe families will camp for the night in areas we designate for Tribal Journeys camping including the green space across the street from the Tribal Center on Suquamish Way, the Football Field near the Suquamish Fitness Center and several individual camping sites throughout Suquamish. Signs are clearly posted at all camping areas. All camping areas will be cleared by the evening of July 26, 2018 when the canoe families move on to Muckleshoot, the next stop on the journey to Puyallup. 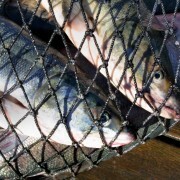 For a schedule of events in Suquamish, click here. SUQUAMISH, WA, January 4, 2018- The Suquamish Tribe has enjoyed a productive working relationship with the State of Washington and the United States Department of Justice (DOJ) in our efforts to address the unique challenges faced by Indian Tribes in states that have legalized marijuana for medical, recreational or agricultural uses. After Washington State legalized recreational marijuana, the Suquamish Tribe was forced to address the issue of marijuana regulation in its Indian Country. The tribal-state system we use today was developed over years of cooperative government-to-government work with DOJ, state initiative and legislation, carefully negotiated State-Tribal Compacts and six DOJ guidance memoranda. Despite the existence of this effective and well regulated system, DOJ today elected to rescind all six guidance memoranda without consultation. “State and Tribal laws were created and crafted in response to the challenges marijuana presented to our communities. 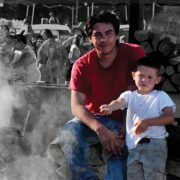 We agree with Governor Inslee that the Washington State system addresses these problems in a manner that is well regulated, keeps out criminals, protects it from falling into the hands of children, cracks down on driving under the influence, and carefully tracks production to prevent cross-border transfer,” said Suquamish Tribal Chairman Leonard Forsman. “The Suquamish Tribe will continue to work closely with Washington State to best protect our people far into the future,” added Forsman. “This is not only about the marijuana industry, it is about sovereignty, voters rights and access to safe marijuana that since becoming legal has resulted in the creation of good paying jobs and much-needed Tribal tax revenue that allows us to buy our lands back and invest in community development,” said Suquamish Tribal Treasurer Robin Sigo. Suquamish is a federally recognized sovereign Tribe. The village of Suquamish and seat of the Suquamish Tribal Government are located on the Port Madison Indian Reservation, along the shores of the Puget Sound near Seattle, WA. The Suquamish Tribe provides comprehensive government, economic and social programs to approximately 1,100 tribal members. In the last two decades, the Suquamish Tribe has become a key economic partner in the region, operating several Port Madison Enterprises business ventures, a growing seafood company and performing property management duties for lease land on the reservation. 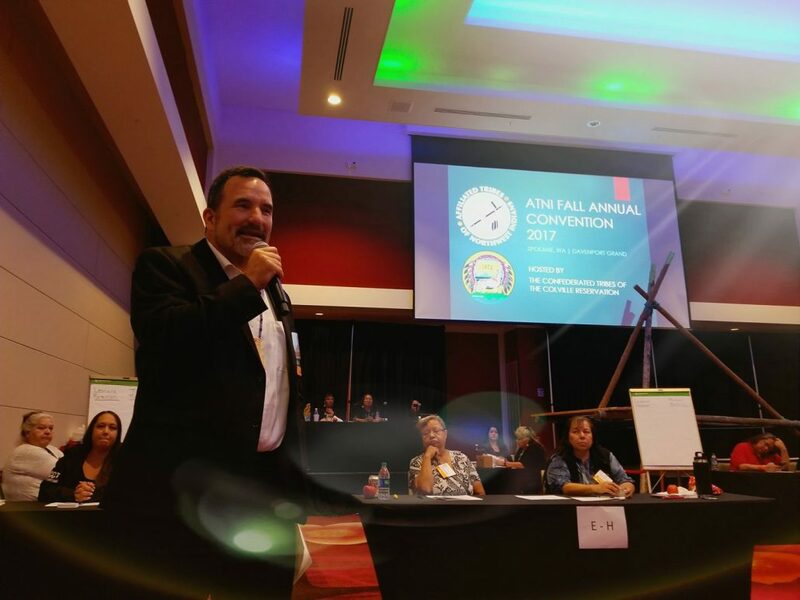 SUQUAMISH, WA- The Affiliated Tribes of Northwest Indians (ATNI) Executive Board has a new president. Suquamish Tribal Chairman Leonard Forsman was elected to the position in a close race against fellow ATNI member and Confederated Tribes of the Colville Chairman Mike Marchand. “I am honored and humbled to be elected ATNI President. ATNI has a legendary reputation as an intertribal organization that is committed to preserving culture, language, fishing and wildlife habitat, and healthy tribal communities. I look forward to leading our organization in continuing to fulfill its mission to advocate for the tribal rights reserved through treaties, executive orders and other agreements. The Tribes of the Northwest are committed to protecting their homelands and their ancient way of life and I will work hard to help accomplish this sacred duty,” said Forsman. Forsman was elected September 20, 2017 during the ATNI Fall Annual Convention at The Davenport Grand in Spokane, WA. He replaces President of the Quinault Indian Nation Fawn Sharp, who held the position for 2 terms and did not seek re-election. “The current climate in Washington D.C. requires us to remain vigilant in our efforts to protect our sovereignty, hunting and fishing rights, health care, education, veterans, sacred places and natural resources from budget cuts and policies and regulatory changes that violate the trust responsibility. We must also work with our allies to protect our housing and economic development programs and initiatives,” added Forsman. 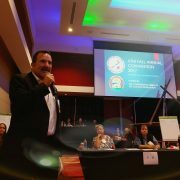 Forsman, a 20-year Tribal Government veteran, is a well-known consensus builder in Indian Country, serving as the Co-chair for the Tribal Leaders Congress on Education, Vice President of the Washington Indian Gaming Association and Vice President of the Federal Advisory Council on Historic Preservation along with several other intergovernmental committees and organizations. “Leonard is a dear friend and champion not only for the Suquamish Tribe, but for all of Indian Country. I know that he will serve all the Northwest Tribes and will represent our interests across the country. I am grateful for his leadership and look forward to working with him as ATNI President,” said National Congress of American Indian (NCAI) President and Swinomish Tribal Chairman Brian Cladoosby. The ANTI Executive Board is made up of 7 positions, with elected officers serving staggered 3-year terms. In addition to Forsman, ATNI Member Tribes also re-elected Theresa Sheldon of Tulalip as 2nd Vice President and Taylor Aalvik of Cowlitz as Assistant Secretary this year. Leonard Forsman is Chairman of the Suquamish Tribe, a position he has held since 2005. Previously, he was a research archaeologist for Larson Anthropological/Archaeological Services in Seattle, Washington from 1992 to 2003. From 1984 to 1990, he was Director of the Suquamish Museum in Suquamish, WA, and has served on the Museum Board of Directors since 2010. His experience and expertise earned him a federal appointment to the Advisory Council on Historic Preservation, of which he is now vice-chair, where he assists in promoting the preservation, enhancement and productive use of the nation’s historic resources. In addition, Forsman has held the position of Vice President at the Washington Indian Gaming Association since 2005. He has also been a member of the Washington State Historical Society Board since 2007, the Suquamish Tribal Cultural Cooperative Committee since 2006, and the Tribal Leaders Congress on Education since 2005. Forsman received a B.A. in Anthropology from the University of Washington and an M.A. in Historic Preservation from Goucher College. The Adventuress will be moored at the Suquamish Dock April 17-18, 2016. 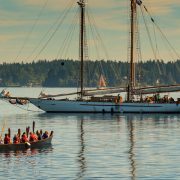 Adventuress – Puget Sound’s official Environmental Tall Ship – to visit Suquamish on Monday, April 17 during Earth Month. The historic ship is one of only two National Historic Landmark (NHL) sailing ships still in active operation on the West Coast. Special thanks to the Suquamish Tribe for making available the use of the public dock. Visitors can climb aboard the ship and learn about its century-old history with a maiden voyage to the Arctic for the American Museum of Natural History, service for decades with the San Francisco Bar Pilots, and role as an on-the-water education platform for Puget Sound youth since 1963. Adventuress is owned and operated by the nonprofit Sound Experience with a mission to educate, inspire, and empower an inclusive community that works to improve our marine environment and celebrates our maritime heritage. 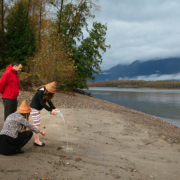 On occasion, the organization partners with Suquamish youth program staff to develop meaningful programs for young people involving both tribal canoes and Adventuress. Adventuress sails “not for one but for all” with the core belief that We are ALL shipmates.